Wh-? 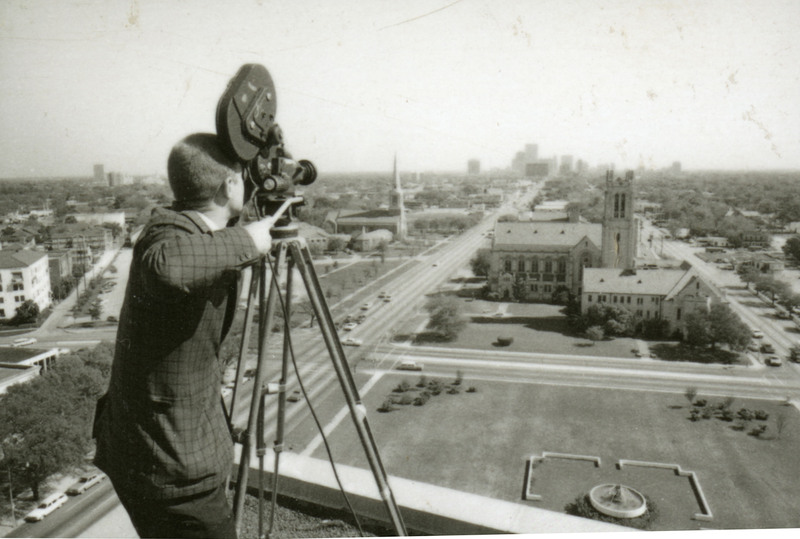 A guy with a movie camera filming straight down Main Street–you can see the Rice campus off to the upper right. Once I got past the nausea this image made me feel I started working out where and when it was taken. It’s all too clearly on a roof, and too close to the edge if you ask me. I think it’s the Warwick. This was taken in a somewhat unexpected spot–in between Jones College (and maybe Brown?) and the engineering quad. That’s the back of Abercrombie there on the left. So I have two problems: when was this taken and what were they filming? If you zoom in on any of these pictures you’ll see from my labels that I guessed 1962. This is clearly wrong. I guessed that because my first instinct was that this might have been part of making the film called “Golden Years,” a very sentimental movie about Rice’s first fifty years. I watched it this afternoon and quickly realized that I was mistaken–these pictures were certainly taken later than 1962. But not necessarily a whole lot later. The difference in clothing between 1962 and, say, 1965 is stark. I’d say we’re more like mid-60s than early 60s here. A satisfying solution to the dating problem will emerge, I believe. The photographer, in an act for which I bless his memory, decided to use up the last few pictures on his roll of film by turning around and taking a picture of a building under construction. I feel sure that this is the Space Science building, which broke ground in 1965 and opened in 1966. And because I have Alex Dessler’s photo chronology of the building’s emergence I think I can date these photos almost to the week. I just didn’t have time to do it today. I have no idea why they were filming though. allowed, and what you got was the only copy. It’s also possible that they’re playing back a freshly-made recording. And a clarification of my own: 70% of the time I’m kidding and 30% of the time I’m bewildered. I’m not sure which is which. Bonus: This post is already way too long, so I’ll save the bonus for tomorrow. It’s always been a fountain (AFAIK), and still was as of a couple weeks ago. Yeah, it was still a fountain when I left this afternoon. But once upon a time it wasn’t there! According to the City Parks Department (www.houstontx.gov/parks/pdfs/2008/MecomFountainRelighting.pdf) Mecom was put in in 1964, so that’s the earliest the pictures could have been made – My guess would be sometime in 1965 for the filming based on Space Science (you’ll get the week right shortly based on progress on Space Science). 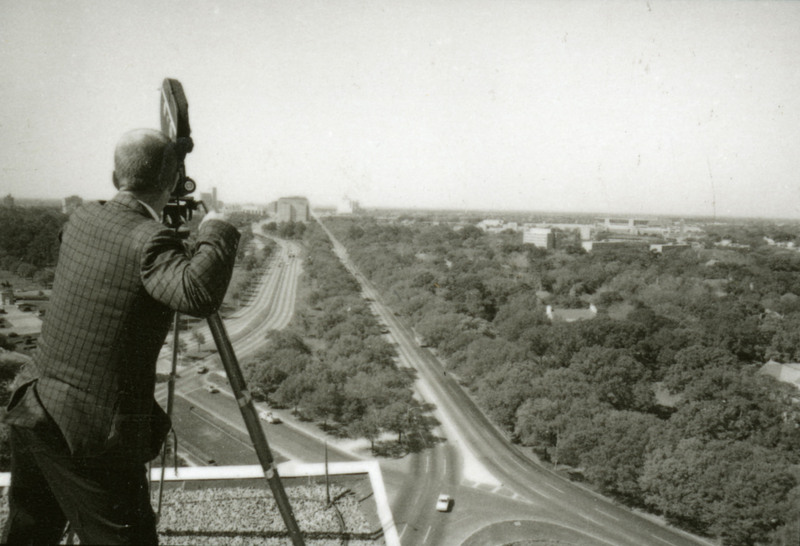 Brown College, which opened in 1965, is visible in the top photo. I vaguely remember them building Mecom Fountain. Back then, we went shopping down town (not to mention movies at the Delman). Foley’s, with Sakotwitz and Joskes right across the street. Seems like Foley’s and Sakowitz gave Rice Students credit cards. 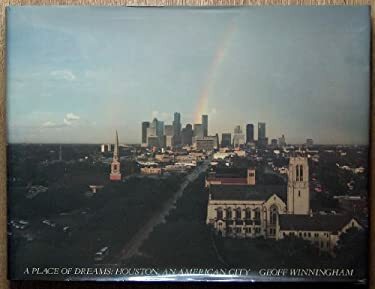 The closest movie to that time period I could find in Houston was Hellfighters, but I don’t remember any of that being filmed at Rice. I don’t think the fountain existed when I arrived at Rice in Sept of 63. Mecom had just bought the Warwick around that time and was in the process of renovating it into a showplace hotel (it had been a residential hotel before). It was certainly there later when Jim Wilkerson, some our friends and I put soap in it. 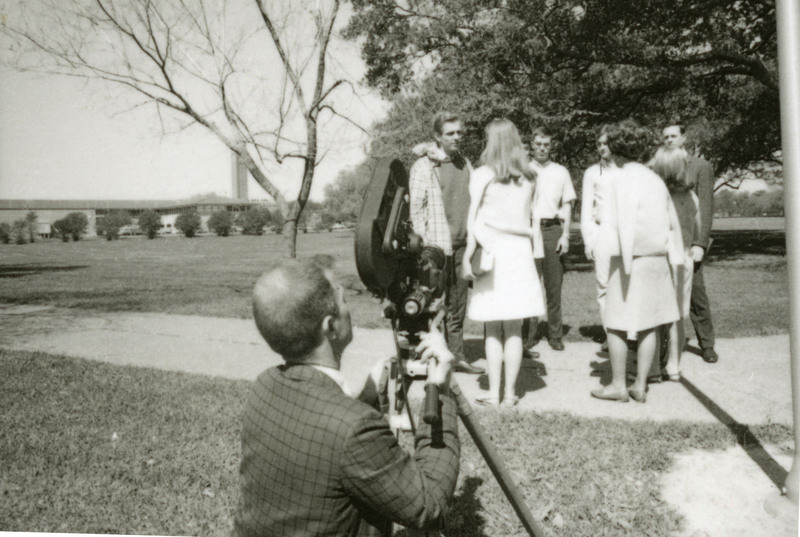 I think that was during finals in the Spring of 64 or 65. 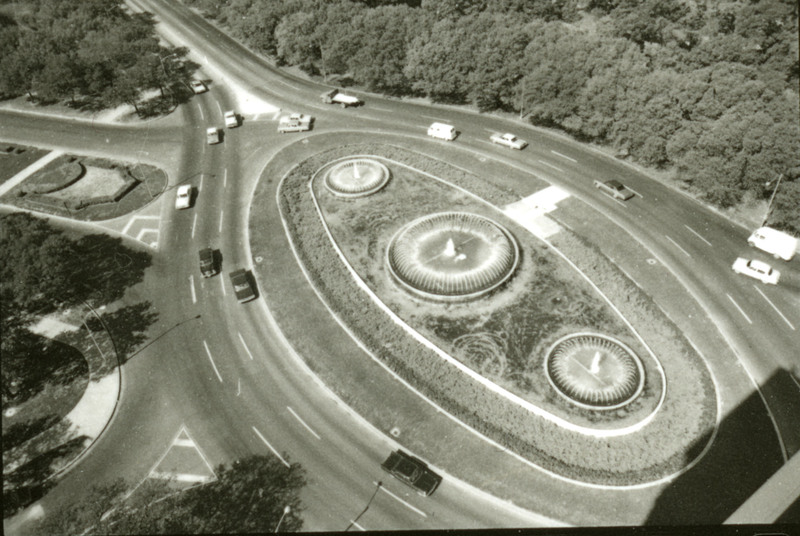 The Mecom Fountain was built in 1964 (http://www.houstontx.gov/parks/pdfs/2008/MecomFountainRelighting.pdf), and I remember well when it was installed. It was roundly criticized because the water spouted so high it would spray cars in the roundabout and make the pavement slick when the wind was blowing. Mecom owned the Warwick, and it was suspected that the fountain he gave the city had been designed mainly to be seen from its upper-story rooms, not from ground level. 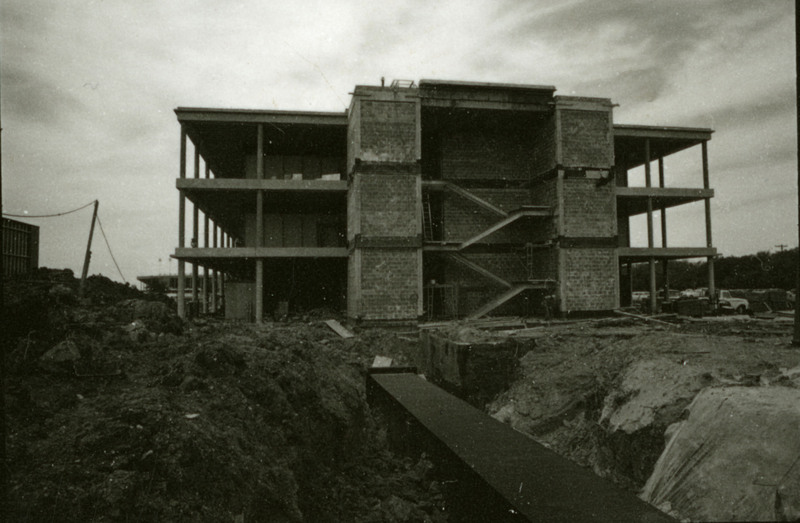 I think the bottom photo shows the construction of the Space Science and Technology Building in 1965. You can see the Geology Building to the left and Rice Stadium in the background. Given that Brown Hall is in the top photo (also 1965), that’s probably the right date.